How a punk kid from L.A. created the coolest publications of the 1990s. In the early ’90s, Jaime Levy, a punk-rock hacker chick from Los Angeles, marched into the Tisch Building at NYU without an appointment. The move was part bombast, part desperation: She wanted to join the university’s Interactive Telecommunications Program, but didn’t think she could have gotten an interview if she tried. She wandered around the fourth ﬂoor until someone led her to the office of Red Burns, the program’s venerable chair, a bristly redheaded matriarch some called the Godmother of Silicon Alley. Jaime was intimidated, but she had only two days in the city, so she told Burns she wanted to tell stories using computers. Burns took a shine to Jaime — a kid with only a skateboard and an Amiga to her name — and gave her a full ride. Jaime spent her years at NYU experimenting with interactive media. For her master’s thesis, she combined the do-it-yourself ethos of punk with the emerging possibilities of desktop publishing, producing an electronic magazine, Cyber Rag, on ﬂoppy disk. With color-printed labels Krazy Glued onto each “issue,” Cyber Rag looked the part of a punk-rock fanzine. Loaded onto a consumer Mac, its stories came to life with images pilfered from the Village Voice, the Whole Earth Review, Mondo 2000, and Newsweek, collaged together onscreen as though they’d been xeroxed by hand. Cyber Rag was the first publication of its kind, built with Apple HyperCard and MacPaint. Along with her animations, Jaime added edgy interactive games (in one, you chase Manuel Noriega around Panama), hacker how-tos, and catty musings about hippies, sneaking into computer trade shows, and cyberspace. After grad school, Jaime moved back to Los Angeles and renamed her magazine Electronic Hollywood. Although she had a day job as a typesetter, she distributed Electronic Hollywood to indie book and record stores, where they routinely sold out. The novelty got her national media attention, which she leveraged into mail-order sales. After her magazines were featured in an issue of Mondo 2000, the cyberculture’s magazine of record, she was ﬂooded with orders and fan mail. Although she made only ﬁve issues, she sold more than 6,000 copies at six bucks a pop — not bad for disks that cost less than 50 cents to produce. Idol’s album ﬂopped, but Jaime kept her rep as savvy netizen. She got a straight job, commuting to White Plains to do “bonehead interface design” at IBM — in her baggy plaid shirts, she was often mistaken for a janitor. A co-worker at IBM showed her Mosaic, the ﬁrst browser for navigating the World Wide Web. She experienced it as a conversion: Her electronic magazines were websites, before websites existed, with hypertext navigation and “pages” of sound, video, and text. “Once the browser came out, I was like, ‘I’m not making ﬁxed-format anymore. I’m learning HTML and that was it.’” She quit her day job. 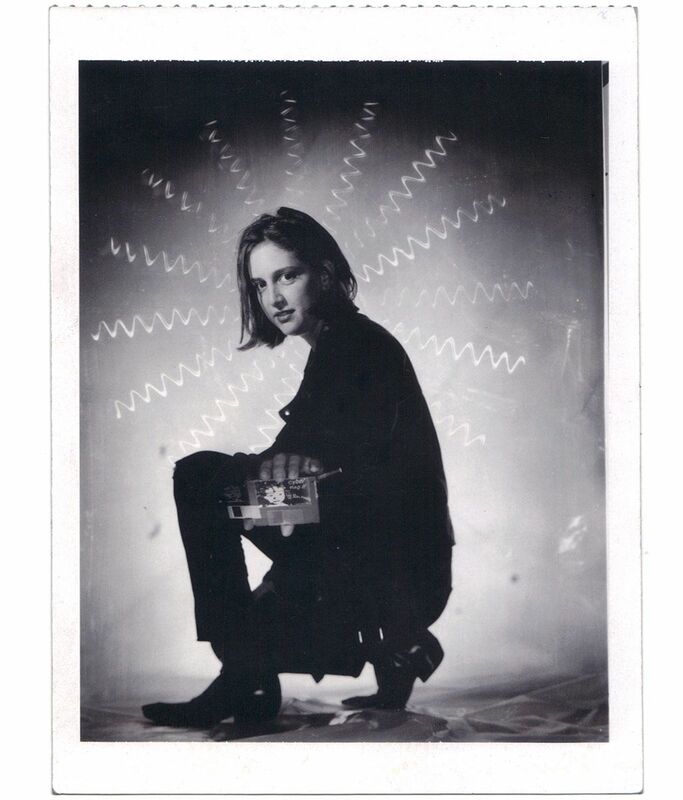 In 1995, a software company called Icon CMT tapped Jaime, then at the height of her fame, to be the creative director of a new online magazine called Word. The budget was good, or at least more than nothing, which is what Jaime had in the Cyber Rag days, and it was early days: Jaime had the opportunity to set a standard for what publishing could do with this new medium. The last thing she wanted was for Word to feel trendy, like Billy Idol’s failed foray into cyberpunk. Thanks to Jaime’s initial mandate for interactive design and some choice early hires—including art director Yoshi Sodeoka—the site came to define the possibilities of online publishing. Here are a few things you might have found on Word.com, circa 1998: Word’s chat bot, Fred the Webmate, a pixelated, misanthropic New Yorker you could talk to by typing questions (Fred was damaged, with sexual issues he often alluded to but never addressed, and if pressed, he claimed to have been recently laid off by a large new media company). An interactive game in which the objective is to pop zits. Meaningless interactive toys, like a cartoon microwave you drag a dog into. At least one ﬁrst-person account from someone who got a coffee enema. The formula worked: By 1998, Word was logging 95,000 daily page views, and 1 million to 2 million hits a week. When the New York Times ran its first article explaining the web browser to its readers, it used Word.com as an example. 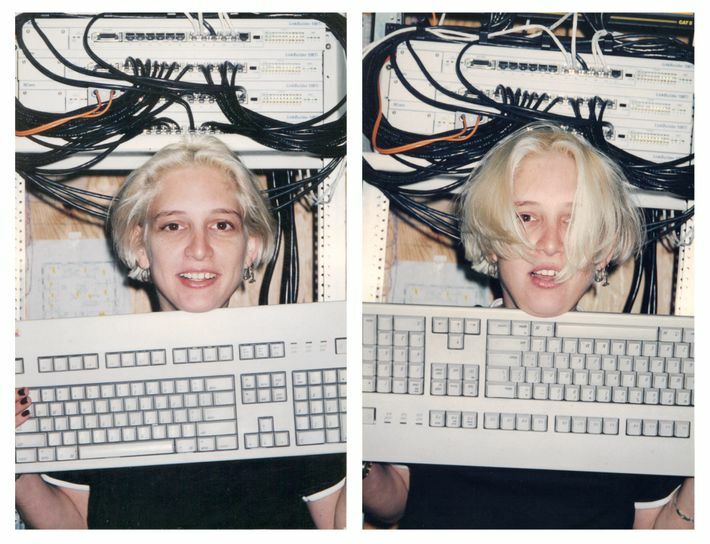 At the tail end of 1996, Jaime Levy threw her last CyberSlacker party. In the escalating fever of the dot-com boom, it was hard for her to stay centered. She wandered away from Word after a year and a half to pursue freelance contracts on her own. Not long after, in a business move only possible at the height of the bubble’s speculative delirium, Word was bought for $2 million by a holding company that specialized in the production of industrial-grade ﬁsh meal. Jaime had assumed that when she left the magazine, she’d ﬁnd another high-paying creative gig, but the landscape had changed. As she tried to scrap together freelance gigs, her annual salary plunged. She spent a year designing Malice Palace, a dystopian chat room based in a postapocalyptic version of San Francisco, decorating it with images of burned-out tech companies, radioactive burritos, and zombie drug pushers. To her great misfortune, she founded her own company, a digital production studio called Electronic Hollywood, on the eve of the stock-market crash. “Something was coming to a head,” she remembers. “It had already been too many years of too much money for no business model, no return on investment.” At 34, Jaime moved back to Los Angeles. She got an apartment in Silver Lake and a car. She started over. The stink of the crash was on her, and when she started applying for jobs again, she omitted from her résumé her tenure as the CEO of a dot-com. Instead, she told interviewers that she’d been a front-end designer at her own company. When Zapata, the ﬁsh-meal processing company, finally shut down Word, it did so very quickly. Jaime had stolen a backup the last time she was in the building, but she got “fucked up and left it on the subway.” At this point, Word has been off-line far longer than it was ever online. Jaime Levy’s ﬂoppies are sitting in her home office, although she’s getting them restored and hopes to show them in a museum someday. But her work is just as important as the fortunes made and lost in the feverish speculation that transformed the web from an academic swap session to the beating economic and cultural heart of our world. She didn’t get rich, and much of what she built has been erased in the slow erosions of the web or else is bound to media inaccessible to anyone but digital archivists with the means to replay them. This makes her achievements difficult to remember, but it doesn’t make them any less significant; her efforts are artifacts, as the web is a dynamic artifact, an endless conversation writing over itself again and again in the soft echo of the boom. 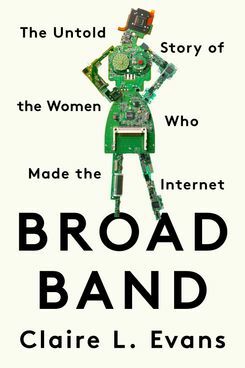 *Adapted from Broad Band: The Untold Story of the Women Who Made the Internet (Portfolio, 2018). Broad Band author Claire L. Evans will appear in conversation with Jaime Levy and Stacy Horn, the founder of EchoNYC, an early social network, at the New Museum on Thursday, April 19, at 7 p.m., presented by Rhizome.org. For more info and tickets, click here.